I thought I would share this great post from Seminole County agent Rome Ethredge’s blog. There has been a lot of confusion surrounding the new farm bill and Generic Base (Old Cotton Base). Early County Agent, Brian Creswell, has some advice that may clear this up some. All crops that will be planted in 2015 will be assigned to generic base first. You do not get to designate what you want on your generic base. It will assigned by taking the total number of acres you plant of each crop and dividing that by the total numbers of acres you planted to give you a percentage of that crop. That percentage will be multiplied by your generic base acres and that many acres of the crop will be applied to generic base. Know that it’s clear as mud the following example may clear things up. 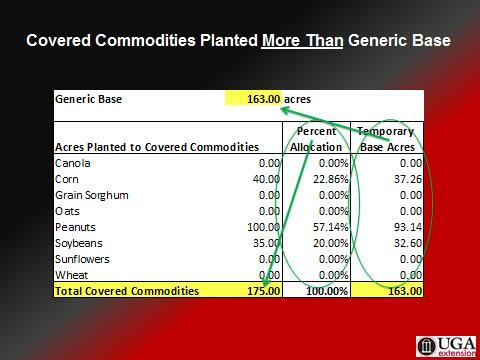 In this example it shows the total number of acres planted in a covered commodity which is 175 and the total number of Generic Base Acres at 163. Corn is 40 Acres planted so 40 divided by 175 gives you 22.86%. Generic base acres are then multiplied by this % (163 X 22.86% =37.26) so 37.26 acres of the 40 that was planted will be assigned to generic base. The equation is the same for each covered commodity you plant. Remember any covered commodity that is harvested in 2015 or that was harvested in 2014(yes it is retroactive as well) will be assigned to generic base. Wheat or Oats planted for grazing will also be attached to generic base. You do not have to plant your assigned base to receive a payment if a payment is given. You do have to plant your generic base to get a payment on that. I would recommend not destroying your rotation. I know we have to get through this one but if we are going to continue to farm we need to keep our rotation right. Cotton is no longer covered. But there is Loan and POP/LDP/MLG on Cotton. The Loan program is not changed or eliminated under the new farm bill. There were/are LDP’s on the 2014 crop and will be for 2015 if prices are low again. Posted in Corn, Cotton, Peanuts. Bookmark the permalink.